Got Adder Combat Cars or Adder Combat Lifters? Got any 15mm scale Human science fiction vehicles? 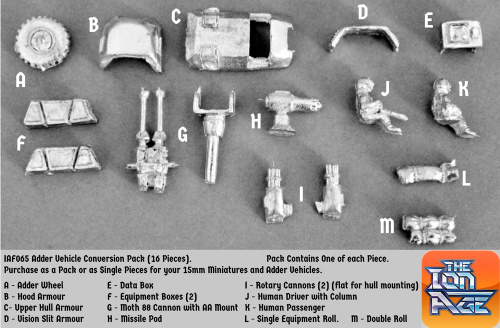 Now at the Ion Age our vehicle conversion pack, whole pack or single pieces. It's your call. Also the last week of our birthday month and special offers and the current free miniature too. Have a look, lots going on. This entry was posted on Thursday, August 28th, 2014 at 23:55 and is filed under News. You can follow any responses to this entry through the RSS 2.0 feed. You can leave a response, or trackback from your own site.